WARNING: This review contains HEAVY SPOILERS concerning the outcome of this movie, and should be avoided by anyone who has not seen it yet and wishes to go in knowing as little as possible. If you want a much less spoiler-filled review, check out the first review here – but be warned, if you choose to continue reading from this point onward without seeing it first, you only have yourself to blame – which is why I am giving you one last chance to jump ship before it’s too late. Good God in Heaven, they actually went there. They just went and gave us one of the most harrowing and disturbing cliffhangers in film history, and to choose that as the point to leave these characters until next year with the (as-yet) untitled fourth Avengers movie, it’s ballsy but also extremely cruel. So, the whole film is about Josh Brolin’s hulking (no pun intended) menace Thanos roaming the galaxy for his precious Infinity Stones, killing anyone that comes in his way like Heimdall (Idris Elba), fan-favourite Loki (Tom Hiddleston) and, perhaps most shocking of all, his adoptive daughter and certified Guardian of the Galaxy Gamora (Zoe Saldana). It’s established almost right away that Thanos is one powerful dude, even without all of the Infinity Stones placed in his giant golden glove, and to see him go to town on all of these characters who we’ve really gotten to know over the course of ten years is kind of like watching a terrorist hijack your favourite cartoon show and mercilessly beat the fun and colourful characters inhabiting it within an inch of their lives right in front of you, on occasion surpassing that inch entirely. It’s completely unpredictable which characters may or may not survive, because it is established that any one of them could fall victim to Thanos’ mighty grasp at any given moment, or that of his creepy minions known as the Black Order that head out into the cosmos to retrieve the Stones for their master. Because of that, you’re constantly on edge when characters like Doctor Strange (Benedict Cumberbatch) are being subject to immense torture in attempts to coerce them into handing over what Thanos wants, and closely watching giant battle sequences such as the climactic showdown in Wakanda to make sure that none of your favourite characters are suddenly, and uneventfully, taken from this earth in the midst of it all. It’s a harrowing and extremely bleak watch at times, because again you’ve become accustomed to these characters and their personal histories over the ten years that Marvel Studios has been leading up to this film, and you’re seeing them placed in situations where literally anything could happen and not many of their options are particularly safe. You see Tony Stark, a character who has literally been with us since the very beginning of the Marvel Cinematic Universe, be physically challenged in ways you’ve never seen him be before, and same with Thor, who suffers severe loss in the very opening scene, not just Loki and Heimdall but pretty much the entire surviving population of Asgard following its destruction at the end of Thor: Ragnarok. All the while, you’re never quite sure if this is a battle they and many of the other characters are going to make it out of alive, and that more than anything heightens the tension even more, since you know that they are dealing with a being who can and will wipe out anyone he so pleases. The films of the MCU have done such a good job at setting up all these characters and their environments, and to see all of them lead to such an intense climax where it could very well spell their certain doom at the end of it all is rather heartbreaking and even nightmarish. Nothing, however, compares to how this movie ends, which is perhaps the most chilling and shocking scene in the whole of the MCU’s history, maybe even of all superhero movies ever. As you well know, having seen the movie – and if you haven’t, then why in God’s name are you still reading this?! – Thanos completes his mission in assembling all the Infinity Stones and using them to wipe out half of the universe’s population. So, lucky us; we get to see beloved favourites just up and disintegrate into the wind as though they were nothing, including (but not limited to) Groot, Bucky, Falcon, T’Challa, Star-Lord, Doctor Strange, and even young Spider-Man in what has to be an even more devastating blow to Stark, his mentor. The disturbing genius is how this scene plays out, with barely any orchestral music and just the sound of rustling leaves in the wind, as characters we have grown to love are suddenly taken away from us while the rest are left to mourn; the Russos have been cunning, and subtly sadistic, in ending this movie on such a downer of a note, so much so that it kind of makes the film feel like an exercise in depressing storytelling all the way through, with this ending being just the salt poured onto the open wound. That doesn’t even take into consideration how Thanos effectively achieves his goal by not only destroying Vision, but by doing so with the exact same tactic used as the assailants in Michael Haneke’s Funny Games (though honestly, it makes far more sense here than it does in that film), which makes it a far bigger blow to audiences’ expectations seeing how it comes directly after it appeared that the heroes finally won. Of course, this is merely the first part of what is already promising to be one hell of a final conclusion, so there’s no doubt that some of the damage that Thanos has inflicted upon the universe is bound to be retconned in some fashion. How exactly that will occur is obviously a mystery, but given the final few frames of the end-credits scene, it’s pretty safe to bet that a certain captain named after the very studio that owns the rights is going to have something to do with it. That’s the beauty of the MCU; even after all the destruction and death we’ve witnessed in this film, there are still plenty of stories to tell, and loads of new and exciting heroes to introduce that help expand this universe to even greater depths. But before any of that, we’ve got to know how this particular story ends, as well as who makes it out okay, and frankly it’s going to be a very difficult twelve months for everyone still on board with this amazing and expanding universe. 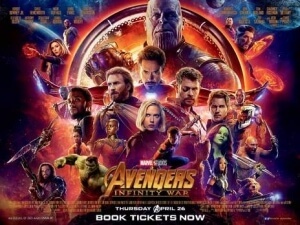 Avengers: Infinity War is still a fantastic and highly epic and operatic superhero movie, even though the numerous deaths and twists will make even the biggest MCU fan feel disturbed and left with a broken heart, especially as characters they’ve come to grow and love over the past ten years are challenged in ways they never have been before.